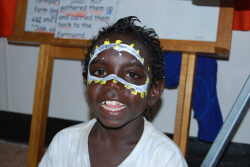 Wadeye is situated approx 400 kms South West of Darwin. 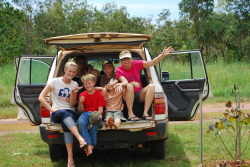 The trip to Darwin by four wheel drive takes between 5-6 hours and is only accessible during the dry season. The community is isolated for up to 6 months every year, due mainly to the flooding of the Daly River, although there is an all weather airstrip with two commercial flights a day to Darwin. The community consists of approx 2,500 indigenous and around 200 white fellas. The local language spoken is Murrinpatha. This is the largest Indigenous Community in Australia. Welcome to our new home for 6 months. So another month and another chapter begins. There are two flights a day to Wadeye (pronounced Wadaire) and it certainly is an attraction for the locals, especially the kids. The terminal, for want of a better word is at the end of the main street, right next door to the school. There were plenty of cars and loads of people milling around as we unloaded all our gear from the back of the old ute that is used to transfer luggage from the plane. We piled up our numerous boxes and esky outside on the ground, wondering which of these people were here to pick us up. Well as it turned out, none were. The plane was reloaded, all those heading to Darwin boarded and the plane left. As our flight was unscheduled and the fact that noboby at the clinic heard the plane land, we were left stranded. Slowly all the cars and people left, and the only thing left was us, standing there with another huge storm looming, like old Nigel no friends. Chris said she felt like Linda Kozlowski in one of the Crocodile Dundee movies when Linda flies into some remote part of Australia, and is the only white face amongst the crowd, with everybody staring at her. Well that was us. We felt as though we should have had a big sign that read, 'Yes, we are new to town'. It was rather amusing and we all had a good laugh at the unusual situation we found ourselves in. Luckily the lady was still in the little office at the airstrip so she rang the Health Clinic and informed them that we were here. Next thing two cars arrived with lots of apologies. Before we even introduced ourselves it started to pour with rain so we were all running around loading our gear into both cars and jumping in ourselves, soaking wet by this stage. Lesley, the clinic manager showed us around town (which didn't take long, but more about that later) and then took us straight around to our house (which is actually one half of a duplex). Our street is on the very outskirts of town (a 5 minute walk to the shop and clinic) and only has white people living in it, most of whom work for health, education or the council. Our first impression of our house was 'wow'. 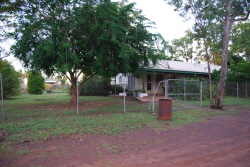 They are low set besser brick construction with corrigated iron roof and a large verandah around 2 sides. We have a 6 ft high fence around the property with large lockable gates. 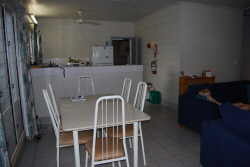 The house is 2 bedroom (big rooms), combined lounge/dining, a good sized kitchen and large bathroom with seperate toilet. The laundry is out the back and is secured and attached to the house with a storeroom. 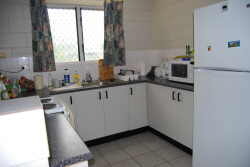 The homes are very well decked out with nice lounge suite, 6 seater table, huge fridge/freezer, a seperate huge upright freezer, microwave, TV, VCR and DVD, washing machine and dryer. All the appliances are brand new with all the furniture only being a few months old. 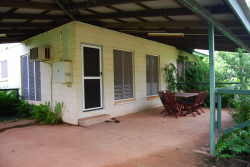 The house is fully airconditioned and very, very comfortable (compared to the camper trailer this is bloody luxury). The quality of the homes, considering where we are is very high and they appear well maintained. The yard was certainly in need of a little TLC as the house had been vacant for a little while, and the weather had been very wet which had made mowing difficult. So our very first day in the neighbourhood was spent mowing, pruning and generally cleaning up. The yard came up really well and has now been nicknamed the 'Botanical Garden' by the others in our street. There was an overgrown fenced vegetable patch down the back that we have resurrected and Chris and the boys are planting all sorts of things that I am sure will be ready to harvest just after we leave in August. So as far as our accommodation goes we are very comfortable. Everywhere in town is measured in walking time, as not that many white people have cars (unless they have a work car). The roads into Wadeye are impassable for up to 6 months a year, so private cars are few and far between. Ours is still in Darwin and will most likely be there until late April/ May when the Daly River drops to at least the windscreen level of the car. As soon as the road opens I will fly in and drive it the 5 hours back. While not having a car may sound a little restricting, the fact is that in the wet there is not really anywhere to go, as everything is flooded. Wadeye is like an island surrounded by floodplains that are full of big snappy reptiles. A couple of hundred metres from home is the river where the barge that brings all our supplies docks (more about this next month). It is also the boat ramp. We occasionally go down there at night and just with the car headlights we always spot a few salties, big salties that is. If a dog jumps in for a swim, as they occasionally do, they don't usually come out. The only place to swim here is the pool or a few waterholes, that are supposedily croc free. We do swim in the water holes but I am always very nervous, especially if there are not others in the water. Safety in numbers I reckon. Now for the town. It is fairly spread out, with the houses a reasonable distance apart. The locals' homes are similiar in construction to ours being besser brick and most in pretty good condition. Their houses do differ slightly in that they are basically one big room with a bathroom down one end and a toilet in a seperate area outside but still attached to the house. They generally don't have a kitchen like we do, but instead have a long bench, with a stove and a sink at one end. Most families have a fridge, while some still prefer to buy food on a daily basis and use it all up. Every home seems to have a big stereo system and they like to play their music loud, in fact very loud. Most houses also have a TV, some with nice big Plasma's. The houses are painted in bright colours so the whole place looks a bit like a licorice allsort. There is a moderate amount of rubbish that is scattered around with 44 gallon drums out the front of each house to burn any rubbish that might make its way into them. As far as we can make out there appears to be no routine rubbish collection, although there is a dump not far out of town. Now dogs, that is something that there is plenty of. They are just everywhere and I have no idea if they actually belong to anyone in particular. Riding around can be a challange as there are plenty of 'Cheeky Dogs' as the locals call them. They are the ones that will have a go at you given half a chance. Town is very crowded during the wet season because all the outstations and surrounding areas are flooded, so all those people have to move into town. During those 6 months there is an average of 18 people living in each house. All goes back to normal at the beginning of the dry, as they start to make their way back to their traditional lands. Regardless of what time you are out at night there are people of all ages everywhere. That is because everyone in the house sleeps in shifts, so if you're not sleeping, you have to get out. This truly is a town that never sleeps. Another unusual aspect of Wadeye is that not one single street has a name. If you need to go to somebody's house it's not as simple as 'I'm at 14 George St'. Its more like, you turn down the street the Police Station is on, turn into the 3rd street on your left, go past the huge pothole and past the house with the really loud music and we are the green house next to the pink house with all the bikes on the roof. Simple really. Why do we need street names??? The main street, which of course is not called Main Street, because we don't have street names, is somewhat attractive in it's own way. 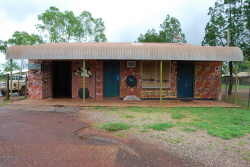 There is the Community Store, Art and Cultural Centre, Fruit and Veg shop and the Women's Art Centre all together. Then a little way down the (unnamed road) is the Mall which has the Post Office, Takeaway Shop, Butcher, Library come drop in computer centre and a few other offices that I have no idea what they are. Next to that is the Police Station and opposite is the Health Clinic. Next to the Clinic is the Council and of course Centrelink. All the buildings are nicely painted with Indigenous art work. The median strip has the most lush green lawn you have ever seen and is always mowed. Just down the road towards the airport is the Community Pool and the local school. The school is a P-12 with the high school building being brand new, in fact only open this year. There is even a tennis court. The pool is open everyday and is of course free. They even have swimming lessons for the boys each Saturday, also free, waterpolo Monday nights and laps everyday between 5-6pm. And you thought we were going bush. There is a rumour that Myers and the Coffee Club are planning to move in, but I am not sure if the intel is credible!!!!!. There are two football ovals, with the main oval being near creek camp (about a 10 minute walk from home) and the other 100 metres from home. 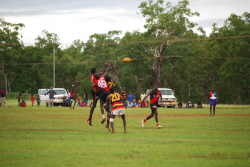 Aussie rules is very big up here and there are 4 local teams. We have adopted the 'Bombers' also known as Essendon as our team. Both Saturday and Sunday afternoons are reserved for football and we have not missed a Sunday game yet. We are the only white people to go and we yell and scream much to the amusement of the locals. I am sure the locals come to watch those idiot white fellas as much as they do the football. We are on the top of the ladder at present with the Grand Final being on the 5th April . That will be a big day in Wadeye. The question we get asked the most is 'Do we feel safe?' and 'What about the riots? ", that I am sure many of you saw on TV just after Christmas. Let's start with the infamous riot. There are two main gangs in town, the Judist Priests and the Evil Warriors. We have seen no gang action since being here and don't really expect to. As for the Boxing Day Riots, well that would appear to have been a bit of creative journalism. Yes, there was a bit of rock throwing, and the odd spear, but that was about as good as it got. The white fella that filmed the whole thing (and most likely put them up to it) was removed from his job and given 12 hours to leave town. These guys have been having these minor squabbles since time began, for longer than white fellas have been in this country, and I am not really sure why we have to think it so unacceptable. Injuries if any are rare and minor. It is a shame the media can't focus on all the good things that happen, and leave all the sensational crap alone. It is interesting to note that these blokes throwing rocks at each other, go and play a very civilised game of football against each other each week. If they accidentally knock an opponent to the ground, they always help them up and so far we have not seen one fight or display of bad sportsmanship. Can the same be said for a game of football in any other major centre?? As for feeling safe. I can honestly say I feel safer walking around here than I do in Bundaberg. Chris and the boys happily walk all around town with no fear. If you treat the locals with respect, they will treat you the same way. The boys even walk home from school (I will explain later) on their own. I would not suggest that females should walk alone at night, but during the day is fine. And yes, the occasional house does get broken into, but I am sure that happens in other places as well. Doesn't it???? We have so far not in any way been subjected to any racial unpleasantries or not respected in any way. We often feel as though we are invisible because the locals take no notice of you at all. In saying that they are a very friendly bunch and will come over and ask you your name and want a bit of a chat. There's a million little kids running around day and night and they are the most gorgeous and happy little things that you have ever seen. So why are the boys walking home from school, when they are being home schooled? Well, there is a perfectly simple explanation. It was well known around town, well before we arrived here, that a family was coming and that I would be working at the clinic and that Chris was a teacher. Teachers are, as you would expect, in very short supply out here, and one that doesn't require accommodation is even better. Teacher accommodation is very limited, so much so that the Principal and her husband (the one and only town Doctor) have two teachers living with them. So an experienced teacher who already has a home is like a gift from above to these guys. They gave us two weeks to get settled before Pat (the Doctor) started to suggest that Chris should contact his wife. Every day he reminded me to get Chris to call his wife until finally Chris caved in and rang. And guess what? She started at the school the very next day, working 3 mornings a week doing 'Special Needs'. So the mornings that Chris works, the boys go to school. It's a funny set up as the boys do one lesson in their class and then for the next lesson the white kids go to another room with a teacher and do their distance education. They also get to do sports, swimming, computers and learn the local language, which is great as it is those things that are hard to do at home. It is actually working out really well and is a good mix. The boys also get the experience of being only one of 12 white kids in a school of 700. The school must be a logistical nightmare with staff coming and going and kids turning up when they feel like it. The school supplies all meals for students and staff including breakfast, morning tea and lunch. Lunch is a hot meal with juice, fruit and a chocolate if they stay all day. As well as that, Chris and the boys get picked up each morning and taken to school. Now that is service. As for the home schooling, it was a little daunting and somewhat overwhelming at first when the 4 large boxes of books arrived, but it is starting to make sense and slowly falling into place. Harry is doing two lessons a week over a phone linkup, and looks so cute sitting there with his special phone and headset. He really enjoys it and looks forward to it each week. The boys have plenty of mates, so as far as education and socialisation goes (for those of you worried about that aspect of our trip) it is all good. I must say that the NO homework thing is the best. It seriously should be abolished in the best interest of the kids, the child-parent relationship and for the family unit. So much stress over something that is so unnecessary. Off your soap box, Brett. My job at the Clinic is going well. It was and still is a very steep learning curve but is also slowly falling into place. There are three groups of people that come to work in these places. Misfits, Missionaries and Mercenaries. I am still not sure which one I fall into, most likely a bit of each. Staff out here are well paid, but also work fairly hard. Most of the staff are nice, with a few misfits thrown in. All in all they are a good bunch. The down side of the job is the call (for those who know me are aware that I am not a fan of call) but it is not so bad as mostly it is only in and out. Everytime you are called in they send a driver (a local) around to pick you up, stay with you and drive you home. During the week we are only second on call for the AHW (Aboriginal Health Workers) who see the patients and only call you if they are worried or want advice. The weekends have both a 1st and 2nd on call but you only do a 12 hr stint on call, so it isn't too bad. Each Clinic has an ambulance that we use for any emergencies or to transfer patients to the airport for air evacuations (Evacs). When the ambulance gets dirty I bring it home and the boys wash it. They think they are so important. So combine a very good pay, free house, phone and electricity and you have a very attractive package. For anybody thinking about a change of scenery and in need of a real adventure, we would recommend this to anyone. Remember, nothing ventured, nothing gained. And guess what, you can always go home. So while we don't yet have our car out here, we now know enough people who do have wheels that have shown us most of the local attractions that are accessible at present. I also have been lucky to have the use of a 250cc registered trail bike to buzz around on. The same guy who owns the bike also has a great 14 ft tinnie with a 40 hp outboard that we can use whenever we want, so you had better watch out Barramundi's, we're coming to get you soon!! So we have now been here just on 6 weeks and going well. We should have our car out here by the end of April / early May if we don't have a late cyclone or lots of rain. Unfortunately there is still 8 metres of water over the crossing at Daly River, which is just a little deep to negotiate. The dry season has started and already things are starting to dry out. We are still having the odd afternoon storm, but nothing like the monsoonal rains we have had for the past few weeks.We are told this has been the best 'Wet' that they have had for years, so once again it has been a great experience. I have seen heavy rain on the East Coast before, but nothing like what we have seen up here. Non stop, day after day, and not a gutter or any drainage in the entire town. The locals tell us there will be one more monsoonal downpour that they call the 'Knockem Down Rains'. These are the rains that knock down all the tall spear grass, that really signals the beginning of the dry. So the weather now is clear sunny days, with it rather hot if you are out in the sun during the day. Surprisingly it is not as humid as we expected. So while that is not everything we have done this month, it is all we are going to tell you about at the moment (have to keep something for the next issue). Next month you will see some of the local waterfalls, swimming holes and some of the natural beauty that surrounds us. Stay tuned. This really is 'Living the Dream'.